824 pages | 419 B/W Illus. Transbronchial Biopsies: Clinical Perspective. Endobronchial and Transbronchial Biopsies. Pediatric Lung Biopsy. Interstitial Lymphocytic Infiltrates. Interstitial Fibrosis, Predominately Mature. Clinical and Radiologic Diagnosis of Interstitial Infiltrates. Interstitial and Intraalveolar Fibrosis, Preominately Immature. Intraalveolar Exudates/Inflitrates. Clinical and Radiologic Diagnosis of Intraalveolar Infiltrates and Exudates. Pulmonary Eosinophilia. Clinical Diagnosis of Pulmonary Eosinophilia. Small Airway Lesions. Pulmonary Hemorrhage. Pulmonary Hemorrhage. Clinical and Radiologic Diagnosis of Pulmonary Hemorrhage. Granulomas and Granulomatous Inflammation. Clinical and Radiologic Diagnosis and Types of Granulomas. Enlarged Airspaces. Pulmonary Vascular Lesions. Vasculitis. Clinical and Radiological Diagnosis of Pulmonary Vascular Disease. Diagnostic Approach to the Patient with Necrosis on Lung Biopsy. Transplant-Related Pathology. Clinical Diagnosis of Transplant-Related Problems. Intra- and Extracellular Structures. Molecular Diagnosis of Infections. Nonmalignant Versus Malignant Proliferations on Lung biopsy. Preneoplastic and Preinvasive Lesions. Clinical Diagnosis of Pulmonary Neoplasms. Radiologic Diagnosis of Pulmonary Neoplasms. Nonmalignant vs. Malignant Proliferations on Pleural Biopsy. Clinical Diagnosis of Pleural Disease. Radiologic Diagnosis of Pleural Disease. Malignant Epithelial Neoplasms. Differential Diagnosis of Neuroendocrine Lung Neoplasms. Benign Epithelial Neoplasms of the Distal Lobular Unit of the Lung. Spindle-Cell Neoplasms of Lung and Pleura. Biphasic Pulmonary Neoplasms. Uncommon Endobronchial Neoplasms. Localized Pleural Tumors. Molecular Diagnostics of Pulmonary Neoplasms. Molecular Diagnostics of Pleural Neoplasms. 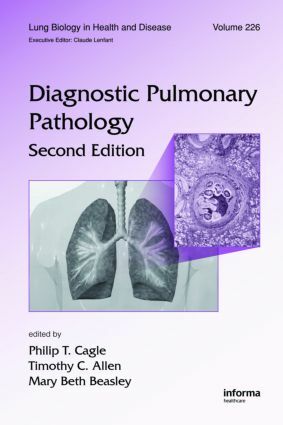 PHILIP T. CAGLE is Professor of Pathology at Weill Medical College of Cornell University, New York, New York; President of the Pulmonary Pathology Society; Editor-in-Chief of the Archives of Pathology and Laboratory Medicine; and Director of Pulmonary Pathology at The Methodist Hospital, Houston, Texas. Dr. Cagle is the author of over 500 peer-review publications, review articles, book chapters, and abstracts. He is a member of multiple national and international committees and panels including the United States Canadian Mesothelioma Reference Panel and the Programme National De Surveillance Des Mesotheliomes. In 1992, Dr. Cagle was the first person to receive the prestigious Alfred Soffer Research Award of the American College of Chest Physicians. He received the B.S. degree in Biology from Lambuth College, Jackson, Tennessee, and the M.D. degree from the University of Tennessee, College of Medicine, Memphis. TIMOTHY C. ALLEN is Chairman, Department of Pathology, The University of Texas Health Science Center at Tyler, Tyler, Texas. Dr. Allen received his Bachelor of Science in Biology from Texas A&M University, College Station; his M.D. from Baylor College of Medicine, Houston, Texas; and his J.D., with honors, from the University of Chicago Law School, Illinois. Dr. Allen has published over 80 peer-reviewed publications. MARY BETH BEASLEY is Associate Professor of Pathology, Mount Sinai Medical Center, New York. Dr. Beasley received her B.S. in Biology from Wake Forest University, Winston-Salem, North Carolina, and her M.D. from Tulane University School of Medicine, New Orleans, Louisiana. Dr. Beasley has written over 35 peer-reviewed articles and book chapters.